Neither of us is very good with paperwork. We get as far as opening mail, paying bills, and making haphazard piles of receipts and warranties here and there, but it’s always a struggle to find something we’re sure we’ve seen recently. Getting all my stuff in order for my green card application was a nightmare because I don’t have a good system. I’ve got two expanding file folders, a little portable file folder, and some of those Rubbermaid bins with inserts to make them into filing drawers, but I don’t have a filing system. 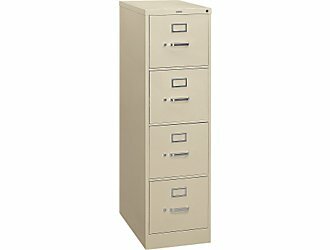 Craigslist recently provided us with a nice 4-drawer filing cabinet similar to this one and we’ve been making decent headway against the mountains of paper. The goal is to have a small accordion folder with the most current stuff handy, and to use the filing cabinet for the more long-term papers, like medical information, taxes, warranties, and old school transcripts. Now we need to decide how to categorize everything. One drawer each, and then a joint drawer for the house and car and cat stuff? Straight-up alphabetical from the top down? Luckily all the hanging files are easy to move around, so we’re starting by just filing it away for now to get it all off the counters and coffee tables, and the rest can come later. I’m excited about having one central location for all the paperwork, because it should cut down on the panic attacks I get when I can’t find my social security card or marriage certificate for something important. Unfortunately, I think we both have a tendency to keep things “just in case”, which helps us accumulate much more paper. It’s hard to know what I need, though. Do I need my old tax returns from Canada? I haven’t filed taxes there since 2007. How many months or years worth of utility bills do we need? Should we keep any from the old address? How about my copy of the lease from my first apartment in the US? I don’t know why I would need it, but it seems too important to toss. There are some sites I’ve found that help you figure out how much to keep, but I find myself disagreeing with them and wanting to err on the side of caution. Maybe that’s a habit I need to break? This entry was posted in Uncategorized on October 26, 2011 by antijen.